Looking for other movies like Black Panther that you will love? While this outstanding superhero movie is definitely in a class all its own, there are some other flicks that will excite you just as much. Let’s check them out! 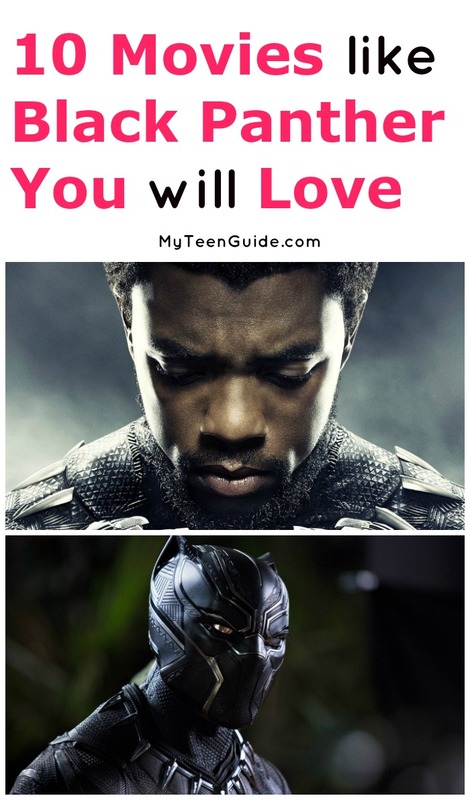 Don’t forget to check our favorite Black Panther quotes. Black Panther is getting loud touts as one of the best superhero movies to date because it is visually stunning, it has a great cast and a moving story that resembles other origin stories, but it still stays surprisingly unique. The diversity aspect doesn’t hurt either. There are not that many superhero movies with black leads, and Black Panther delivers with force on that front. It is safe to say that even people who aren’t really fans of superhero movies will love Black Panther because it tells a universal story of taking responsibility even if you are not ready for it. And if you like Black Panther, there are plenty of similar movies out there for you, and I have made a list of 10 movies like Black Panther you will love. Since this movie is actually a predecessor to Black Panther in the Marvel’s cinematic universe, it has to be included in this list. In addition to that, we also get a chance to meet Black Panther, or Prince T’Challa, in this movie, which makes it a must-watch before you go see Black Panther. ►Don’t miss our favorite quotes from Captain America. Avengers: Age of Ultron is yet another prequel to Black Panther in which we see a glimpse of things to come. In fact, we get a very brief glimpse of a file on Ulysses Klaue, in which his connection to Black Panther is revealed and announced. This next entry comes from a different comedic universe, DC Comics, but it is very similar to Black Panther. First of all, the leading role is a woman, which is almost as uncommon as a black superhero. Second, she must fight to save her island from the raging war, just like Black Panther does for Wakanda, his homeland. Here’s another throwback to DC movies and perhaps its most beloved superhero, Batman. There were so many movies about this lone vigilante and you could choose any of them, but the best thing to do is to start with his origin story. Also, when you combine one of the most popular superheroes and one of the best directors of today, Christopher Nolan, you get fantastic results, which are even more prominent in the remaining movies of this trilogy. You don’t want to miss those, trust me. What connects Batman and Black Panther? Well, the black suit, obviously. When it comes to diversity, it’s hard to beat Guardians of the Galaxy. After all, it is a group of “heroes” from different planets fighting to save the Galaxy. And it is also a part of the same cinematic universe as Black Panther. And the lead role is played by Chris Pratt. What more could a man want from a superhero movie? If you ever played the game, then you will certainly love the movie as well. The origin story of wars between humans and Orcs shows just how fear and hate can lead to unnecessary destruction. The leaders on both sides are very similar to Black Panther in character and that is why this movie deserves a spot on this list. It is also a visual feast just like Black Panther. ►Do you know these Warcraft Movie Quotes? When Bruce Banner loses his temper, he becomes the Incredible Hulk. We all know the story of Hulk since he is one of the most recognizable comic book heroes, and this movie about his beginnings and struggles resembles the story of Black Panther in so many ways. Yes, The Godfather. Bet you didn’t expect that. This classic drama has a very similar story. After the death of Don Vito, his son Michael has to take over the reins of the empire, all the while dealing with betrayal, other mafia heads who are after him and moral dilemmas that pressure him on the way. Even the director of Black Panther, Ryan Coogler, admitted that his movie drew some inspiration from this evergreen classic. This is another movie from the Marvel universe, and another superhero with an incredibly powerful suit, just like Black Panther. It is an origin story that explains how the eccentric billionaire Tony Stark became a masked superhero Iron Man. Before Black Panther, there was Blade. One of the most iconic black heroes from Marvel, this is the role that made Wesley Snipes even more famous. Even though many would disagree whether Blade is a superhero, this half-human, half-vampire does the one thing that qualifies him as a hero – he protects the human race, by killing vampires with a unique sense of humor and smile on his face. There is a great number of superhero movies and TV shows out there, but only a handful of them truly stand out and bring something special to the table. Black Panther surely is one of them, just like the rest of the movies from my list that I hope you enjoyed. Do you have any other favorite movies like Black Panther? Tell me below!